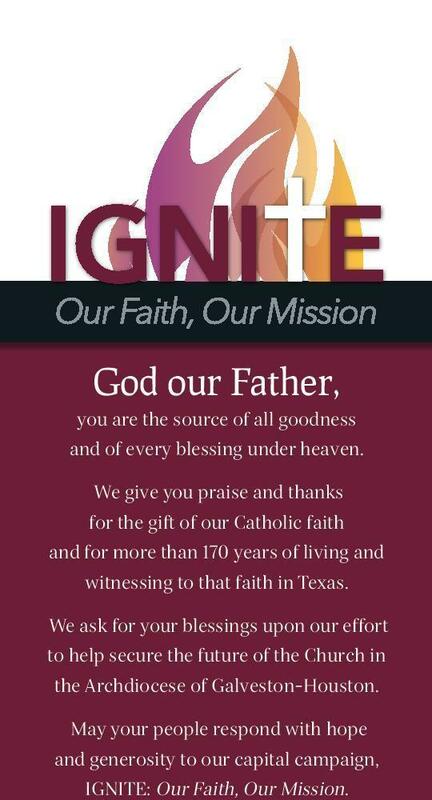 On August 15, 1974 under the leadership of Bishop John Morkovsky, S.T.D., the Diocese of Galveston-Houston established the Catholic Community of St. Matthew the Evangelist. At the time of its founding, St. Matthew’s served the areas bounded by West Little York, Vogel Creek, Jersey Village and the proposed Northwest Freeway. Its original congregation consisted of 374 families under the leadership of the Rev. Richard Johnston, S.C.J., as Pastor, and Rev. John Pringle, S.C.J., Assistant Pastor. Until the new church could be constructed on Hollister Drive , Sunday Mass was held in the Eisenhower High School Auditorium. A few weeks into the establishment of the parish, plans for the Parish Council, Building Committee, Religious Education Program, and Ladies Club had been set into motion. On December 13, 1975, a groundbreaking ceremony was held and the beginning of the dream of St. Matthew’s started to become a reality. The first Mass in our new Church was celebrated on December 4, 1976, with 664 families registered. The dedication of our new home was an occasion to look back over the first two and a half years in a spirit of thanksgiving to the many people who aided us in the work of building a parish family. To proclaim the good News in word and by individual example. To lead people to place their faith in Jesus as Lord and Savior. To transform secular life by sharing the values of the Kingdom of God . To develop a Christ-like community of prayer and worship. Over the years, in response to our mission statement, St. Matthew’s parishioners reached out to the community and the larger diocesan family. In answer to the apparent needs in our own area, a Social Concerns committee was developed and became operational. This group ministered and reached out in areas such as home repair, justice and peace, as well as to the sick and elderly. St. Matthew’s, in conjunction with other area churches, helped to provide food and financial assistance to families in our community who needed a helping hand. Over the years, we have also provided support and help to our sister parish, Our Lady of Guadalupe. In 1983, due to the tremendous growth of the northwest area of Houston , the Diocese created a new parish, St. Maximilian Kolbe. With the new boundaries the composition of our parish changed. Many of our families were now located in the new parish. Until July of 2004, St. Matthew’s continued to be served by the Congregation of the Priests of the Sacred Heart. In July of 2006, the archbishop assigned the Disciples of Hope, a religious order from the Philippines , to serve our parish with Rev. Luis Evardoni as pastor and Rev. Vincent Saavedra as parochial vicar. As off June 15, 2015, Daniel Cardinal DiNardo appointed Rev. Martial F. Oya as the new Pastor. Today, St. Matthew’s is a vital part of the northwest Houston community. Our membership numbers 1070 families, and continues to reach out to our community through our various ministries and organizations. What we are today is due to the support, love and courage of all of our members past and present. You have made the Community of St. Matthew’s what it is today.